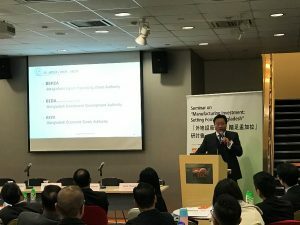 (Hong Kong, 27 February 2019) – Mr Felix Chang, Chairman, Chief Executive Officer and Executive Director of Evergreen Products Group Limited (“Evergreen” or the “Group”; stock code: 1962), a leading global manufacturer of hair goods, served as keynote speaker at Seminar on Manufacturing Investment: Setting Foot in Bangladesh yesterday. During the event, Mr Chang shared with attendees his insights into operating in Bangladesh, including the latest developments and business environments as well as the cost advantages, drawing from 10 years of experience in the country – Southeast Asia representing an important part of Evergreen’s manufacturing base. Evergreen has been strategically deploying its production facilities since 2009. In addition to the production centres originally located in China, a production base has also been established in Bangladesh. The Group currently has two production centres in Bangladesh and three in China, and plans to complete construction of three production facilities in Bangladesh by the end of 2019. The production facilities in Bangladesh, which account for Evergreen’s principal manufacturing capacity, occupy a total GFA of 109,944 square metres with about 18,000 local employees and has significantly contributed to the Group’s profitability. Owing to its strategic factory deployment plan, Evergreen has recorded substantial revenue growth of 22.1% to HK$373.3 million, with adjusted net profit increasing by 32.1% to HK$54.7 million during the first half of 2018¹. 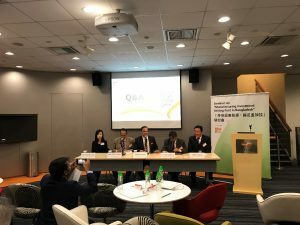 At the Seminar on Manufacturing Investment: Setting Foot in Bangladesh, organised by the Hong Kong Trade Development Council (HKTDC), and with the support of the Bangladesh government, Mr Mehdi Hasan, Consul General of the People’s Republic of Bangladesh to Hong Kong, was invited to deliver welcome remarks. Aside from Mr Felix Chang, the seminar also invited Dr Khalilur Rahman, Foreign Service Officer, Ministry of Foreign Affairs, Dhaka, Bangladesh, to introduce the Bangladesh government’s foreign investor policy, and Ms Jacqueline Yuen, Economist, Asian and Emerging Markets Research Team, HKTDC, to analyse topics including the macro-economy and trade laws in Bangladesh. Photo 1: Mr Felix Chang, Chairman, Chief Executive Officer and Executive Director of Evergreen shares his experiences with seminar attendees. Photo 2: “Seminar on Manufacturing Investment: Setting Foot in Bangladesh” serves as both a seminar and workshop for encouraging interaction among participants.